Overview – The McKesson Ultra Tab Closure Brief is an ultra absorbency diaper with tabs for heavy incontinence needs. The hook and loop tabs are soft, wide and can be refastened anywhere on the brief. The leg gathers provide added comfort and protection against leakage. They are for urinary incontinence, and not rated for bowel incontinence. Absorption – The McKesson Ultra Tab Closure Brief is for the person needing heavy incontinence coverage. The hi-loft premium acquisition layer rapidly absorbs fluid into the core. The advanced core locks this wetness away and reduces the pH of the urine for odor control. Fit – The hook and loop tabs allow for adjustment in the fit around the leg and waist opening. The tabs will refasten anywhere on the brief. The leg gathers help prevent any leakage from occurring. A good snug fit is a must in leakage prevention. Odor Reduction – The McKesson Ultra Tab Closure Brief has the advanced dual-core that locks the wetness away. This reduces the pH of the urine for improved odor control along with better skin health. Additional Products – While the McKesson Ultra Tab Closure Brief is rated for heavy capacity, it may be necessary to add booster pads to the product for over night use. Your body has a higher elimination during the relaxing night time. Some add the cover ups over the diapers as extra protection and peace of mind. Suggestions Alternatives - Style and Also Bowel - For those that prefer the pull on style, there is the McKesson Protective Underwear Ultra. For those needing bowel incontinence protection there is the Prevail Stretchfit Brief. I like the feel and fit of this product but still leak at night. What can I do? Many people add the adult diaper booster pads to add additional capacity to their favorite product. The addition of booster pads can add anywhere from 4 to 16 ounces to the capacity of the product. For most, that is enough to get them through the night and wake up dry. I have bowel seepage, will this product work? While not rated for bowel incontinence, for seepage it may work for you. But for full bowel incontinence you will want to use a product rated for that, such as the Prevail Stretchfit Brief. Is there anything I can do to protect my mattress? These work great but just want some added protection. 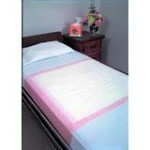 There are a wide variety of styles and sizes of underpads available. You also can choose between reusable or disposable. The reusable ones will save you money in the long term as they are machine washable. Why do I need my waist measurement at the belly button? This is the place the measurement takes place from the manufacturer. This measurement will help you find the correct waist size in the product you are interested in. Fit is the key to leakage control and comfort. If the product fits your body correctly, you will have a comfortable fit with no leakage. I wear a medium in the brand I am currently using, don’t I just need a medium in the new brand I want to try? There is no sizing standard for incontinence supplies. It will depend on the market place that the manufacturer is trying to pin point. So a medium in one product does not mean the same thing in a different product. Always check your sizing charts. About McKesson– McKesson is a pharmaceutical distribution supply chain. They provide health care services, medical supplies and equipment to help address the challenges the health care organizations face. They provide products, technology and resources that are needed to operate more effectively, lowering costs and improving patient health. This product ships direct from McKesson and is usually delivered within 48 hours of placing your order. Sometimes takes three to four business days instead of two. If there are any problems with your order, you will be contacted. Non-opened cases of this product can be returned. We do not return open packages or packs. There is a 15% restocking fee and a $9.99 return shipping fee that is deducted from your credit. The rest will be returned to you via your original payment method. We stand behind all of our products. We freely and quickly replace any defective items. We care about our customers. We give thorough help by phone (866-559-0353), ask-a-nurse, and email. We want to be here for your full solutions, for what works. Let us know how we can assist you. Want your products to arrive automatically with no hassles when you want them? Our auto-reorder service lets you pick when you want your product to arrive, what interval you want them in, what products you want, and they get automatically delivered to your door each month (or other time interval) without hassle or worry. We also lock the price for one year. Your price will not go up during that time. See our auto-reorder page or contact us by phone 866-559-0353 or email for details. Discreteness and Quietness– This product ships in a brown overpack box, discrete. If you order a case it ships in the case that it comes in from the manufacturer, which are brown cardboard boxes. There generally is a packing slip and shipping label, it's discrete. No where does it say what's inside. Because of cloth-like backing, this product is quiet to wear, and it is not terribly bulky. not comfortable ,doesn't seal tight, wish i didn't change my order.